Generally, zebra finches are birds with the scientific name; ‘Taeniopygia Guttata’ and they can be found in Indonesia. They look very interesting but people only look at their appearances without really understanding them. There are actually a few amazing facts about zebra finches that allow you to get to know them better. Well, zebra finches live in forests and huge grasslands near rivers. They can be found in forests with trees or huge bushes because they love nature just like us! However, nowadays they are reared by humans as pets or even used for experiments and genetic researches in the laboratory. Although their original habitat are forests or grasslands, we still can keep zebra finches as pets providing we know what to do to provide them the best place to live in. If you wish to keep them, there are a few tips that you can refer to when it comes to their houses. They can be reared in cages and even aviaries that you can either put them in indoor or outdoor. These wonderful birds are able to suit themselves in many different environments but you should remember that you cannot place them under the rain. If the environment changes too quickly, they may not be able to keep up with the pace. Therefore, when it comes to providing them the best habitat, you should keep them in cages or aviaries with drinkers and food pots. That should be enough. If possible, keep them indoors. Basically, it is very easy to feed them as they are quite tolerant. However, you should not also simply feed them because if you intend to keep zebra finches as pets, love them with all you can! Well, zebra finches can be fed with seeds for tiny birds. You should provide them a mixture of different types of seeds so that they can enjoy varieties. Bear in mind that they can really eat a lot! On top of that, they love greens as in leaves. Organic greens are much preferable because they are healthier! Do not simply pick leaves or grass anywhere for them because that will make them sick. Thus, if they have grown too fat just because of eating too much, make them move around more and do not cut down on food amount. Besides, zebra finches also need sufficient amount of water. Remember to change water in the drinker so that they can drink fresh and clean water. In a nutshell, it is easy to keep zebra finches as pets. If you have the passion, you can become a great master. Be patient and take good care of them. If you love them, they will love you back. 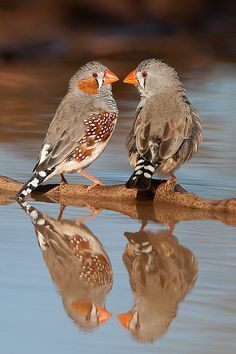 Zebra finches are colorful and entertaining. Having them at home will definitely spice your each and every single day. They are also amazing singers! They can let out sounds like beeps or something that sounds like a trumpet. Their songs will change according to their maturity, and male zebra finches usually use songs as a sign for mating. They use songs to attract female zebra finches. However, we can enjoy their songs and bring more fun into our lives!